I had to laugh and cry, looking at the photographs of the huge, red and white balloon with cameras attached using duct tape. This is sad. 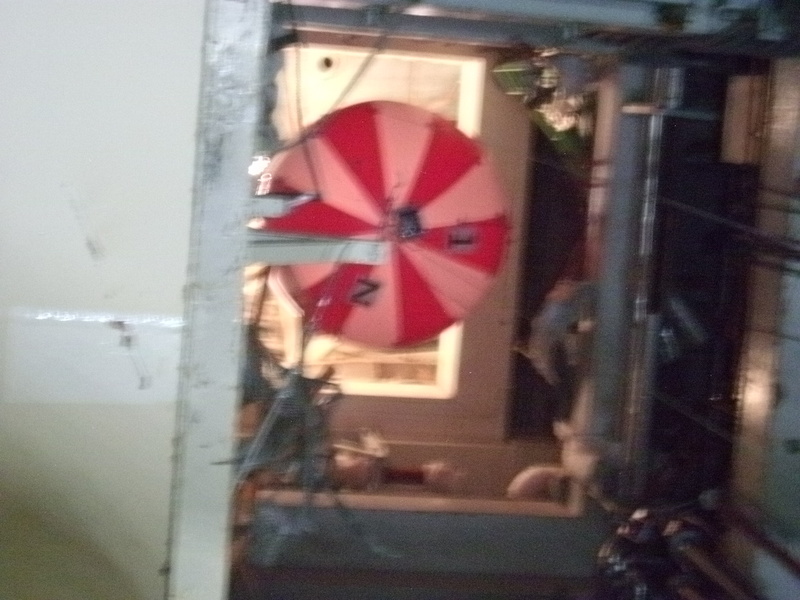 According to TEPCO's press release on 8/8/2012, the balloon couldn't pop out onto the operating floor (5th floor) because it was stopped by a cable on the 4th floor. The balloon did take photographs of the 4th floor. 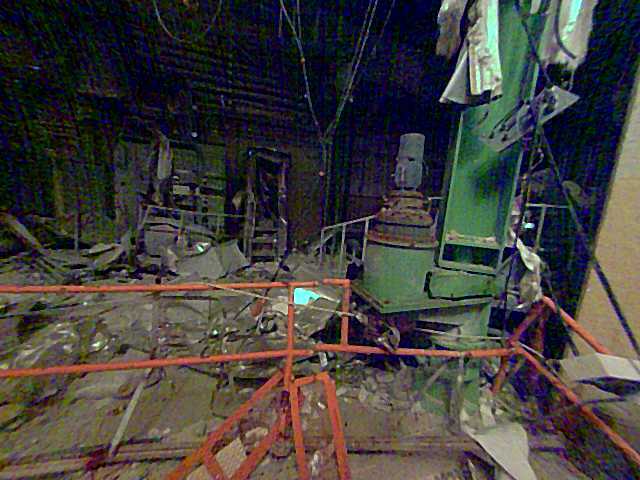 5 TEPCO employees and 14 affiliate company workers did the work, for about 35 minutes, receiving maximum 1.54 millisievert for the shortened work. The investigation was conducted to understand the current condition of Unit 1 operating floor (5th floor) and provide inputs to the consideration of fuel removal from the spent fuel pool. 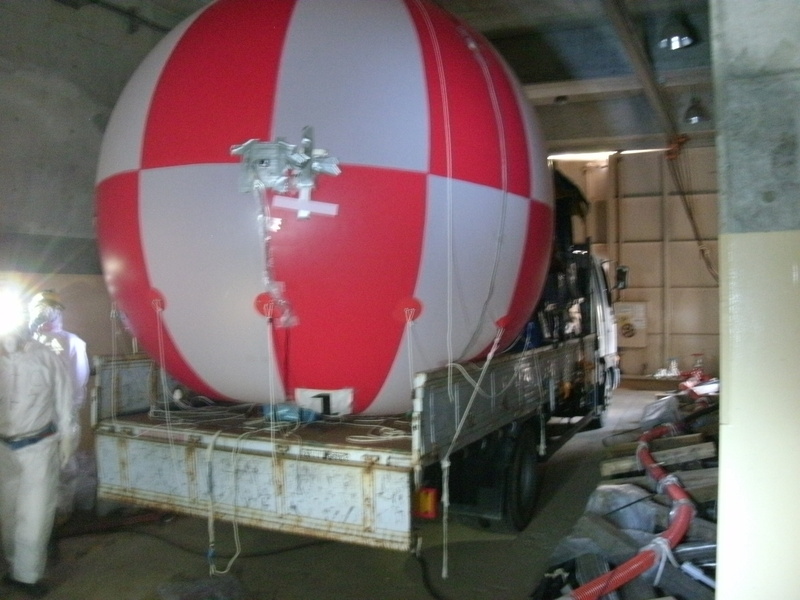 Though the following items were planned to be investigated by utilizing a balloon equipped with a camera, the balloon was unable to reach the operation floor as it interfered with a obstacle which is assumed to be a cable. An irony, balloon and debris, I agree what you meant. 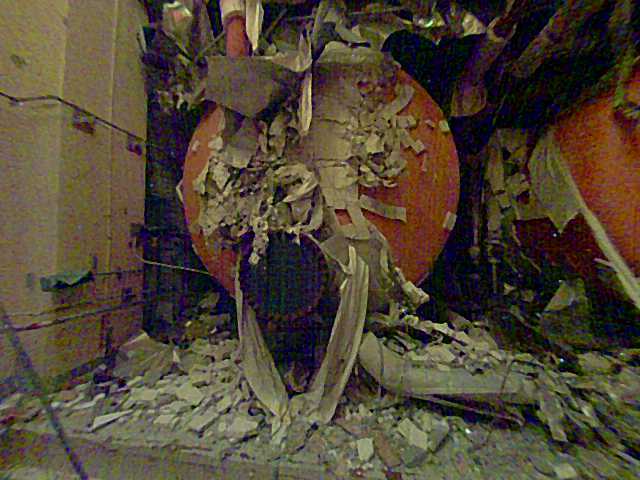 This is a iconic example how Tepco is thinking and handling the disaster. A balloon and duct tape... How desperate can you be? It also shows that they have no solution and no ideas how to'fix' this. It's clearly infixable, but 'm affraid it will take a few more 'balloons and duct tape solutions' before they ( goverment and big corp. ) can/will admit it's hopeless. In the mean time ( a few years probably ) they will try to start more nuclear reactors, to be able to keep the cashflow going to their endless deep pockets. The money is too juicy to let this just stop right now. And that's why we will see more of these actions; completely meaningless, but as long as they can keep the show going on an pretending they are 'fighting' against this disaster, the money keeps coming. It's all about the money ( as usual ) and the bill is paid by... right, we, the people, the taxpayers, and in Fukushima and surroundings they pay the highest price... their lives. Sad there is still not enough 'uprising' in Japan ( and the rest of the world). 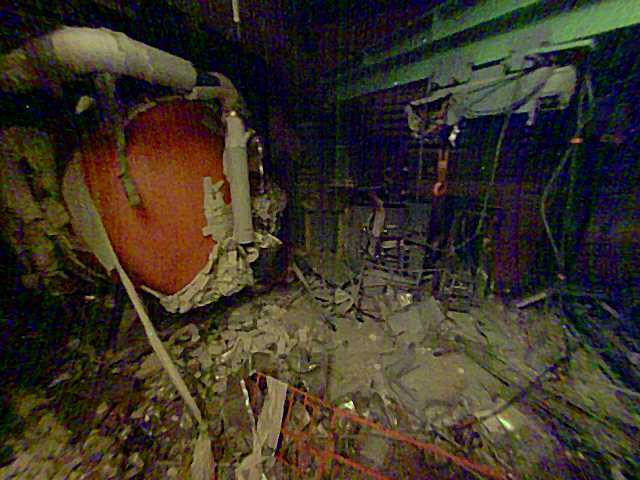 Every day that this continueing, is a lost day for the people of Japan and in particular for those poor souls in Fukushima. By the way, I'm not hating on Apple, I'm hating on people who blind themselves to danger because they're too busy orgasming at the illusion of modern human technology. I recently realised that, despite removing important functionality, Apple's products are popular because they are simple. I think this is because people draw correlations between "futuristic" technology and simplicity, to the point that no knowledge, effort, responsibility or intelligence is required on the part of the end user. I may have previously commented that "it's ironic how humans became intelligent, only to make themselves dumber". This is what I meant by that, and stuff like this balloon survey only reminds me of this illusion. With all the supposed advancements we have, we are still often utterly helpless. Everyone seems to whack off to the illusion that we're living the high life, when we're actually sitting on a ticking time bomb. Everything is moving in this direction of simplicity and luxury. It's an illusion because everything behind the scenes is still complex, and in cases like nuclear tech, still dangerous. As a result of humanity striving to perpetuate this illusion, people in general are becoming less knowledgeable. It doesn't help that most people nowadays have no choice but to slave away on specific professions with virtually no time left for anything else - not even for sleeping, nor for family or for socialising. Media and specific groups pushing distrust for one other over things like race and gender doesn't help either. I'm not sure if I've already said this, but I've considered that at some point in time, we may be faced with a worldwide disaster but lack adequate numbers of relevantly knowledgeable people. For example, the average person has absolutely no idea how nuclear tech or radiation works. If all the world's experts perished attempting to curb such a disaster, the rest of the world would be completely screwed. In a disaster, I doubt they would have time to educate new people. With this in mind, I think there's something wrong with the widespread use of technology that the majority of the population have absolutely zero understanding of. As far as I know, none of these things are even taught in school edcation. Anyway, uh... I just meant to write a short comment and ended up talking about various issues again. I'll just post this comment anyway, in case anyone finds it interesting or educational. My apologies for cluttering the comments with mildly unrelated matters again. This would be laughable if it was not so tragic. This is what happens when people worship money. The Powers That Be are blind. Why dont they use a remote controlled vehicle like a mini Cinestar 8 for this kind of job. Japan, country of cutting edge high tech using a balloon for this operation? cmon guys. Japanese government should destroy tepco and take over his clean up opeation with international help before all japan is ruined. Patrick, thanks for the video. I doubt that it is too dangerous, the cover is on the opposite side (diagonally) from the SFP which is covered by metal sheets. I second the comment that a balloon and duct tape is actually a pretty good first attempt to solve this problem. Now they know it doesn't work due to obstacles, I wonder if anyone will think of the next-best idea: grenade launcher, firing a grappling hook or spear, with a pulley and cable loop attached. Then pull a camera up the cable like a flag. I am assuming that technical equipment would likely fail due to high radiation? Selfcontrolling, flying robots recently introduced in California (as reported in this blog) would otherwise have been the ideal vehicle. If true that technical equipment either can't handle the radiation and/or would not be able to maneuver, trying the balloon was indeed a good idea. However, what is laughable or tear-jerkily sad nonetheless is the red and white colored (next balloon maybe with smiley faces?) proof of what we are reduced to in order to deal with this marvelous nuclear technology that we claimed so confidently to have mastered and under control.